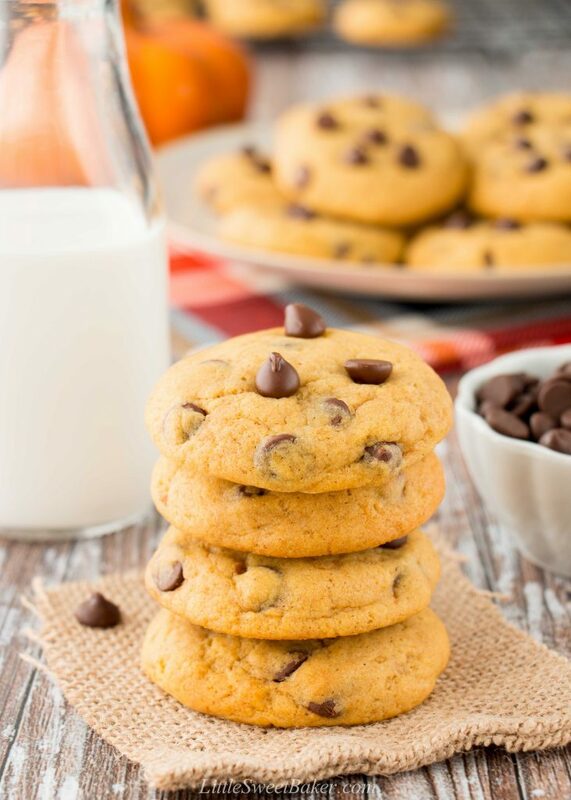 These soft and chewy (not cakey) pumpkin chocolate chip cookies are a perfect taste of fall. They have a lovely pumpkin flavor, are lightly spiced, and have just the right amount of chocolate in every bite. 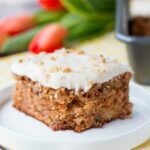 They are easy to make, and stay soft and chewy for days! Even though I’ve started my fall baking, the summer weather is back. I’m not complaining since summer is so short here in Ontario. My kids are loving it because they are still going to school in shorts. Though I had to turn my A/C back on because my kitchen was getting too hot to bake in. Everything was melting in my hands which made it hard to prepare pie crusts or roll cookies (I know, such big problems to have). 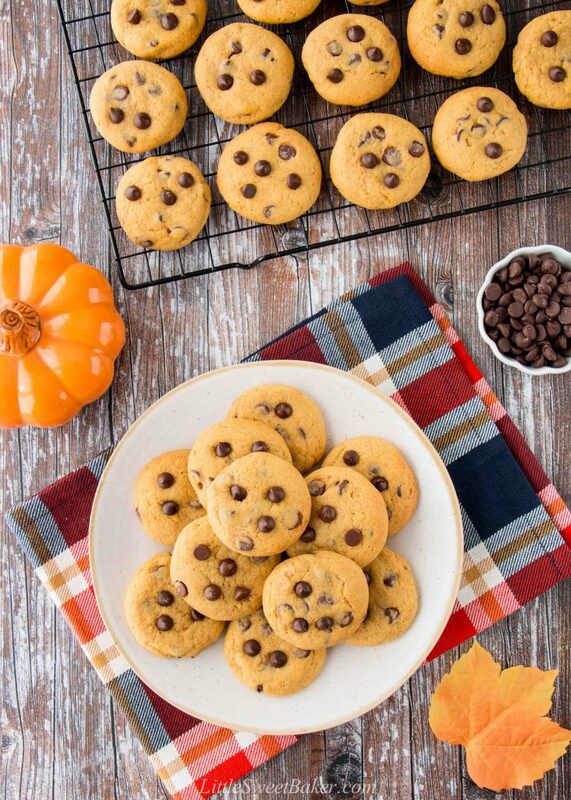 Anyways, let’s talk about what helps make these cookies chewy versus cakey, which can be a challenge when you bake with pumpkin because of the high water content. First this recipe uses melted butter instead of softened butter. 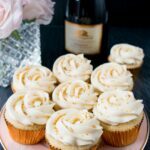 The method of creaming butter and sugar together creates air in the batter making in more cakey. Second, there is no eggs in this recipe. 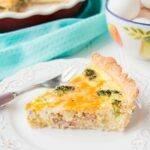 Eggs add more moisture and also creates a rise in the batter as it bakes. Third, you have to chill the cookie dough for 30 minutes. This allows the flour to absorb some of the moisture from the liquid ingredients leading to a chewier texture. It also allows for the batter to rest so the cookies are soft, and allows it to firm up so it’s much easier to roll the dough in your hands. To prepare this recipe, you simply toss all the dry ingredients together in one bowl. Then whisk all the wet ingredients in another bowl. Add the wet ingredients to the dry mixture. Stir until just combined and fold in the chocolate chips. Chill the batter for 30 minutes. 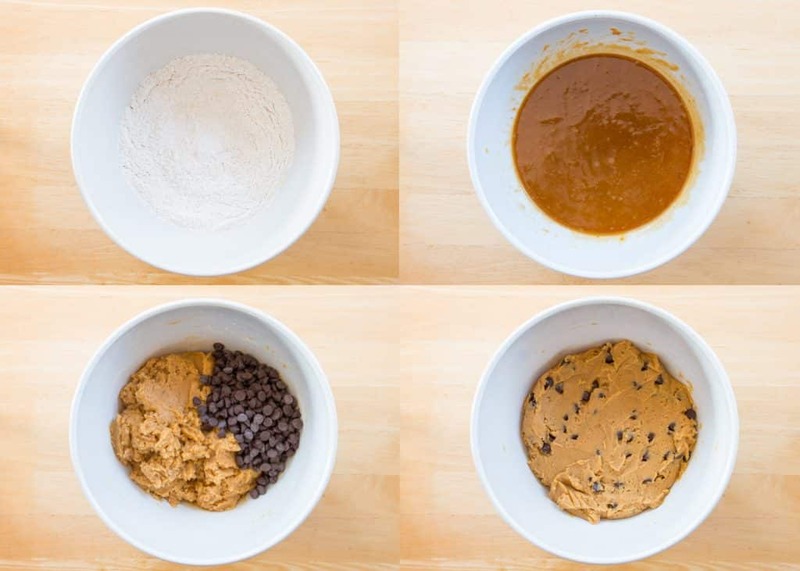 Once the batter is chilled, you preheat your oven and roll out your cookie dough. Now these cookies don’t spread much in the oven, so I flatten them before baking as shown in the picture below. These cookies are already a favorite in our house. I made two batches in a row and couldn’t keep up with the demand. The kids wanted them for breakfast, in their lunch box, after-school, and before bed. My husband would constantly sneak downstairs to grab more cookies. So they are a bit dangerously addictive, but they’re that good. The texture of these cookies is soft and chewy, not cakey. 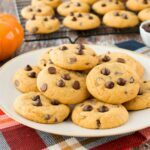 They have a delicate pumpkin taste with a hint of pumpkin spice, and a creamy-chocolatey finish. In a large bowl, toss together the flour, pumpkin spice, baking powder and salt. Set aside. In a medium bowl, whisk together the melted butter, granulated sugar and brown sugar until no lumps remain. Whisk in the pumpkin puree and vanilla until smooth. Add the wet ingredients into the flour mixture. Stir until just combined. Fold in the chocolate chips. Cover with saran wrap and chill in the fridge for 30 minutes. Chilling is a must or the batter will be too sticky to handle. 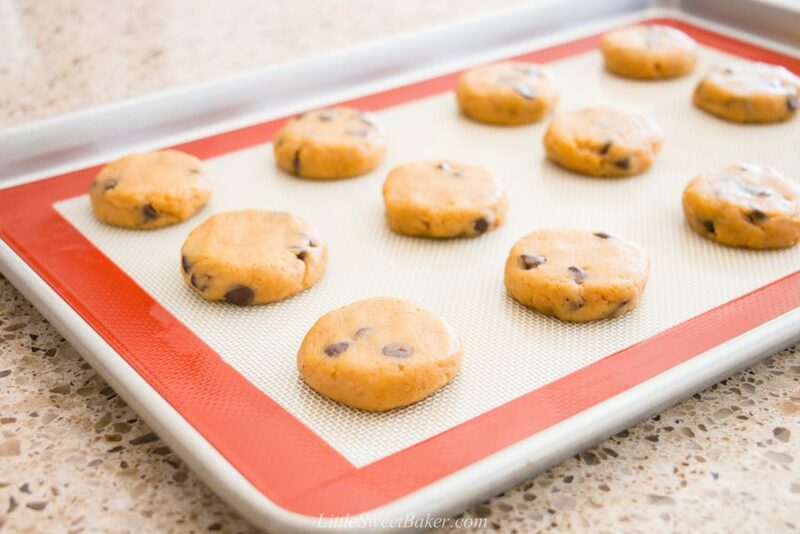 Preheat oven to 350F and line 3 baking sheets with parchment paper or silicone baking mats. 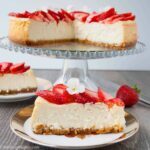 Take the batter out of the fridge. Scoop out the dough using a medium cookie scoop or tablespoon. Roll into a ball and place onto prepared baking sheet. Flatten with the palm of your hands (see picture above). Bake for 10 minutes. Remove from oven and place a few more chocolate chips on top of each cookie if desired. Let cool completely on baking sheet. 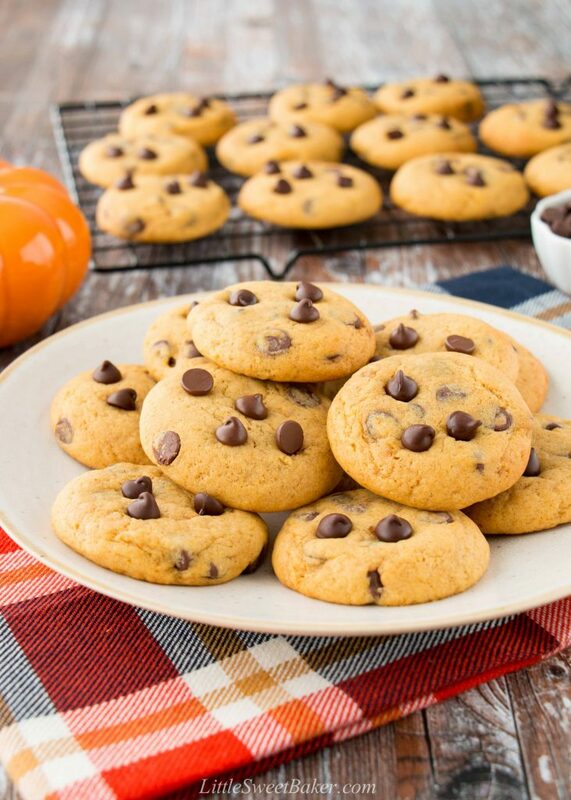 Cookies can be stored in an airtight container at room temperature for up to 4-5 days.